The Conference is held at Frist Campus Center at Princeton University. Below is the facade of the center that is across Washington Road from Ivy Lane. 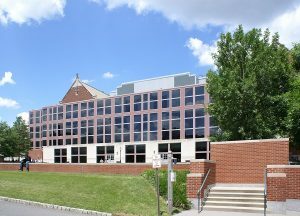 For GPS directions to Frist Campus Center – Princeton Community Works use: 5 Ivy Lane Princeton, NJ 08542. This is the lot across the street from the center. Downtown – There are 3 major parking garages in downtown Princeton. The Spring Street garage, behind the library, is a municipal garage and charges $6.50 for 4 to 5 hours (9 a.m. to 9 p.m.). The other two, one on Hulfish Street and the other on Chambers Street, charge a $3.00 flat fee when entering after 4:00 p.m. and leaving before 7 a.m. Note it is a bit of a walk to Frist Campus Center, so allow ample time. Street Parking – There is parking on Prospect Avenue, but all the spaces are metered. You can pay by credit card, coin or dollars – but these spaces are expensive, and the town will ticket you if the meter runs out. University Parking – There is also free parking in several of the University parking lots. There will be large electronic street signs at the intersection of Washington Road and Faculty Road – and at the intersection of Washington Road and Prospect Avenue. The message on these signs will advise: “to parking in lots 4, 5, 25 and 14” with directional arrows”. Attendees should then follow the detour signs to the lots along Ivy Lane. A map in PDF is available here for download to help find these location: Princeton Parking Maps. Public Bus Transportation: The 606 bus that leaves the Foxmoor shopping center in Hamilton at 3:27 pm and travels through Trenton, follows Rt. 206 from Princeton Pike in Lawrence Twp. and arrives at Palmer Square at 4:43 pm. For a return trip, the bus leaves Palmer Square at 9:52 pm. arriving at Foxmoor at 10:50 pm. The bus will pick up and discharge passengers at Washington and Nassau Streets. The Frist Center is a short walk down Washington Street. Visit NJ Transit’s website. FROM the center of Princeton: Nassau Street to Washington Road. Turn left onto Ivy Lane. See Parking instructions above. FROM Route 1: Exit Route 1 for Princeton onto Washington Road. Follow Washington Road to second traffic light. Turn right onto Ivy Lane. See parking instructions above.